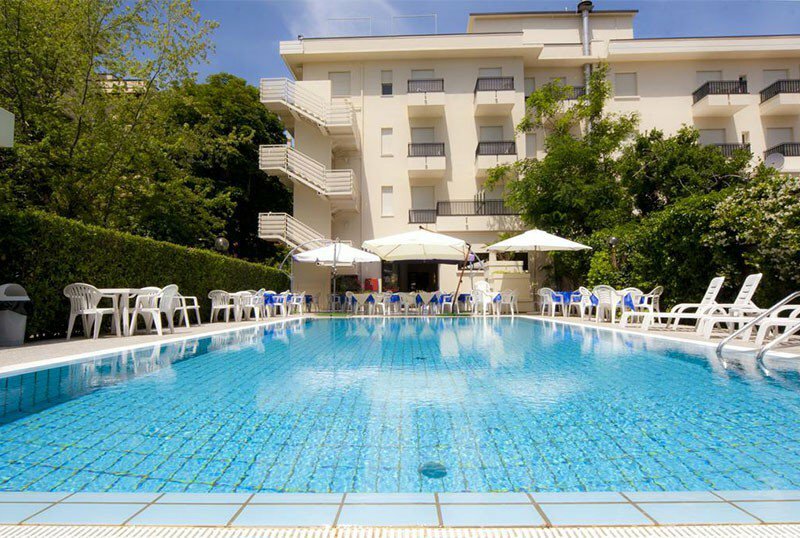 Hotel Reggiana , 3 star hotel in Riccione, is located in the central area, near the sea and Viale Ceccarini. It has a heated swimming pool, a large garden, a parking area nearby and a free garage nearby. Small pets are allowed. The hotel is located in Riccione in a central but quiet area, less than 5 minutes walk from the beach, Viale Ceccarini, the train station and the Palacongressi di Riccione. All rooms are equipped with air conditioning and heating, private bathroom with shower curtain, shower or bath, hairdryer, TV, direct dial telephone, safe and WI-FI connection. Almost all have a balcony. On request: minibar and breakfast in the room. The property has a heated rectangular swimming pool, solarium, large garden, open-air porch, satellite TV room, 24-hour bar, safe deposit boxes at reception, laundry service on request. PARKING: uncovered and free in the hotel until all places are available, external garage and free. BREAKFAST: sweet and savory buffet, set up by the pool. Among the products available: pies, homemade cakes, ring-shaped cake, croissants, cereals, fresh fruit, cheeses, meats, eggs and toast. Among the drinks: coffee, milk, juices and fruit juices. LUNCH AND DINNER: you can choose between 3 menus of meat and fish, all followed by a buffet of seasonal vegetables and various appetizers. The recipes are those of the local cuisine and the products used are local. At meals: baby food , bottle warmer on request. At the beach: swimming pool, entertainment, playground, changing table. In the hotel's garden there is a heated swimming pool, 78 sqm wide, with a depth varying from 120 to 190 cm. The pool is surrounded by sun loungers and tables, where you can enjoy breakfast. The hotel has an agreement with the Bagno n. 70, which has a heated salt water pool, hydromassage, playground, sports fields and entertainment.